Chain link fencingis popular as security fence nowadays. It can be found in many fields, such as prison, highway, zoo, parks, personal houses and others. 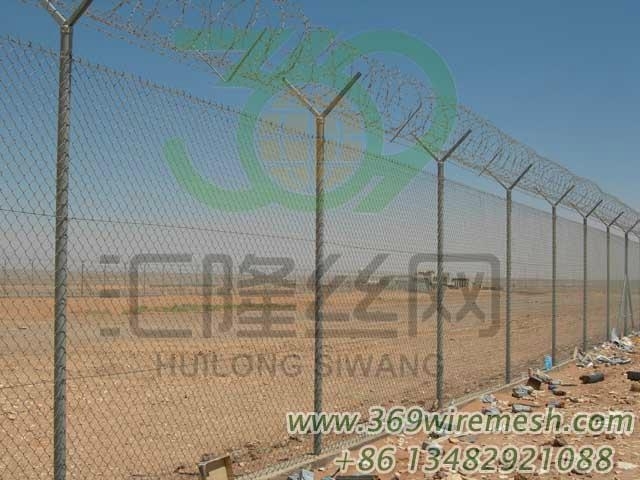 The fence can be used as galvanized chain link fabric, PVC coated iron chain wire fence and stainless steel chain link fence. Heavy type chain-link fences with barbed wire or razor wire fence together can supply high strength used for prison security. 1. Fabric: Heavy Galvanized Chain Link Fabric made from Galvanized steel wire, 3.76mm dia, mesh size 50x50mm, fabric height 2.40M barbed selvage, supplied in rolls of 15 M each. 2. Tension Wire: Heavy Galvanized 3.76mm dia, sufficient for 3 rows. 3. Barbed Wire: Galvanized barbed wire, 2 Ply, 4 Points. Galvanized strand wire 2.50mm dia, Galvanized barb wire 2.0mm dia, spacing between barbs 101mm, supplied in reels of 200 M, sufficient for 6 rows. 4. Line Posts: 60.3mm od x 3.91mm wall thickness x 3.20MR long Galvanized steel post with Galvanized 'V' shaped extension arm on top to take 6 rows of barbed wire, spacing at 3.0 M intervals. 5. Pull Post: 73.0mm od x 5.16mm wall thickness x 3.20M long Galvanized post with 42.2mm od x 3.56mm wall thickness x 6.0 M long Galvanized steel brace rail pipe, Galvanized 'V' shaped extension arm to take 6 rows of barbed wire. Pull Post supplied with standard Galvanized straining fittings like truss rod, turn buckle, tension bar, bands etc., spacing at 152 M intervals. 6. Corner Post: Same as item no. 5 above, but with corner extension arm. 7. End Post: Same as item no. 5 above, but with only half the fittings. 8. Bottom Rail: 42.2mm od x 3.56mm wall thickness x 6.0 M long Galvanized steel Bottom Rail Pipe with galvanized steel clamps to connect the pipes together. Heavy duty arms twine type– Y install on 3" dia fence post, for razor barbed wire. Hole opening at the sides to be 1 1/4 ". Galvanized tie wire, 5/32" wite thickness, standard length per coil 14 meters. Galvanized chain link fence 10 ft height, 5/32" gauge wire thickness, 2" mesh, 50ft length of each roll ASTM A -392 class 2. 60 micron coating.